As long-time readers know, I have been primarily bullish on equities since November 2012 -- but for the first time since then, I truly have no desire to "buy the dip" for anything longer than a short-term trade. There are some disturbing early warning signs that the market may be undergoing a fundamental change of character. I don't presently know how long this will last, but when I see signals like this from the market, I don't screw around and risk gambling away my financial future. One of my trading mottos is "when in doubt, get out." I have often likened trading to poker -- and one of the mathematical concepts required to become a winning poker player is an understanding of "pot odds," which is the ratio of the current pot to the cost of calling a bet. Simply put: if the pot is $100, and calling costs $10, then the pot odds are 10:1. Trading is all about odds as well. In order to become a winning poker player over the long-term, one doesn't gamble, but plays each hand with discipline and according to the odds. Oftentimes, inexperienced players will stay in the game despite the odds stacked against them -- usually this is because they either don't understand the math, or because they like "being in the action" and lack discipline. Sometimes, in spite of their poor play, they'll win in the end -- odds are only odds after all, so even bad odds are mathematically required to win occasionally. Unfortunately, the thrill and reward of these occasional wins encourages bad players to continue playing incorrectly, and -- worse -- often leads them to conclude that their lack of discipline was actually pure, unadulterated brilliance. The problem is, over the long haul players who have no discipline will, without exception, eventually end up 100% dead broke -- and that is a mathematical certainty. I view trading in much the same light, and traders who lack discipline and overplay their weak hands will certainly end up broke as well. 1. The Volatility Index (VIX) rose more than 30% in the last two sessions. Nearly 90% of the time this has happened previously in the past 20+ years, the market has subsequently gone on to make lower lows before making higher highs. Interestingly, the ferocity of the recent VIX rally also argues for a near-term snap back rally in equities, beginning as early as today's session. 2. Precious metals have been absolutely slaughtered lately (I'll work up some PM charts over the next few updates), which means the market is at least considering the thought of a deflationary environment. Further, the extreme volatility in PM's can often be a warning signal that things are about to become more volatile for equities as well. 3. The momentum lows we saw yesterday are rarely reached in exact tandem with the actual price low, and generally we'd expect to see a bullish divergence before price finds a meaningful bottom. Additionally, the up-volume to down volume ratio was high enough that we would expect to see further downside and new lows in the reasonably near future. 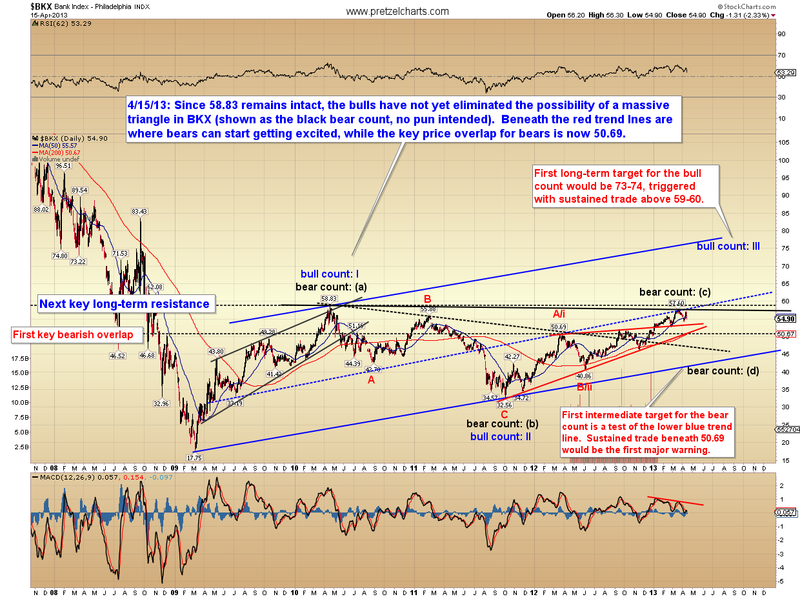 Let's start off with the S&P 500 (SPX) chart. 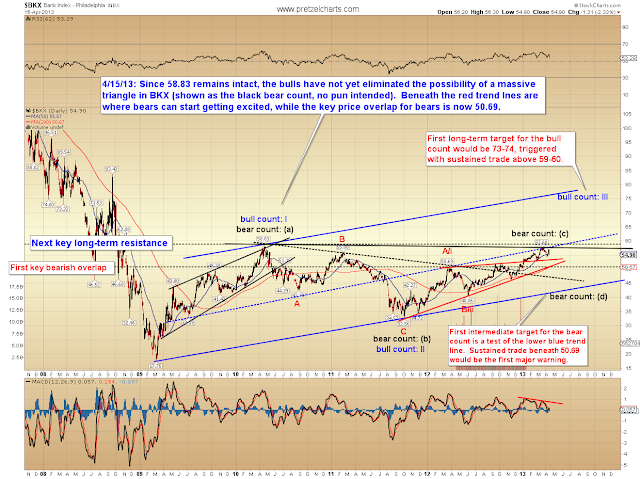 I've outlined my best-guess for a market path that presently appears reasonable to my eye, but do please note that predicting an exact path with the market in this position is exceedingly difficult, so don't be surprised if it deviates. As I mentioned yesterday, there is currently the potential of five complete waves up from the November lows, which usually means we can expect see a correction begin. I spent several hours working with the Philadelphia Bank Index (BKX) last night, since BKX has been a great leading indicator. The chart below outlines one of the remaining bear options for the long-term: If BKX is forming a massive triangle, it will ultimately go on to new lows beneath the 2009 low -- though it would first grind around sideways/down (relative to the size of the pattern) over the intermediate term. 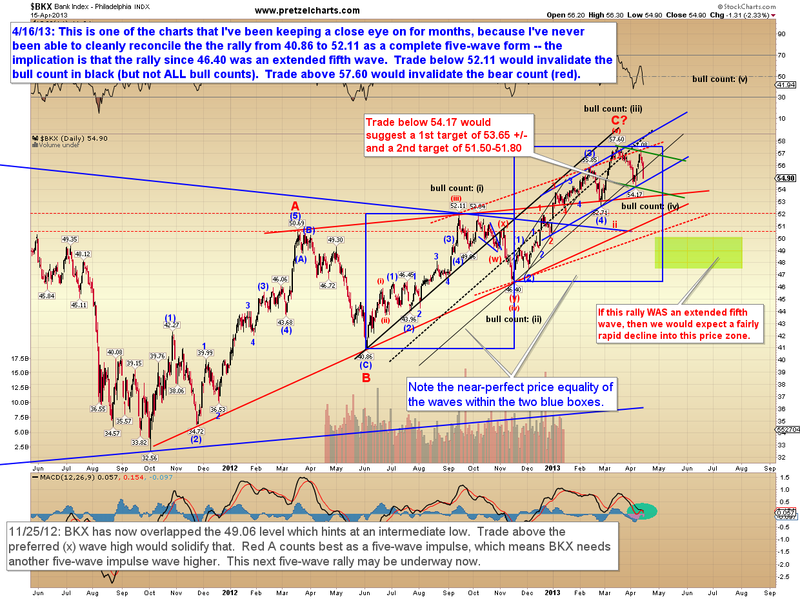 The chart below outlines the next important long-term levels. BKX is one of the markets I've been keeping a very close eye on for several months. A few weeks ago, I made reference to the possibility that a number of markets may be completing extended fifth wave rallies, and BKX was one of the markets I had in mind during that discussion. 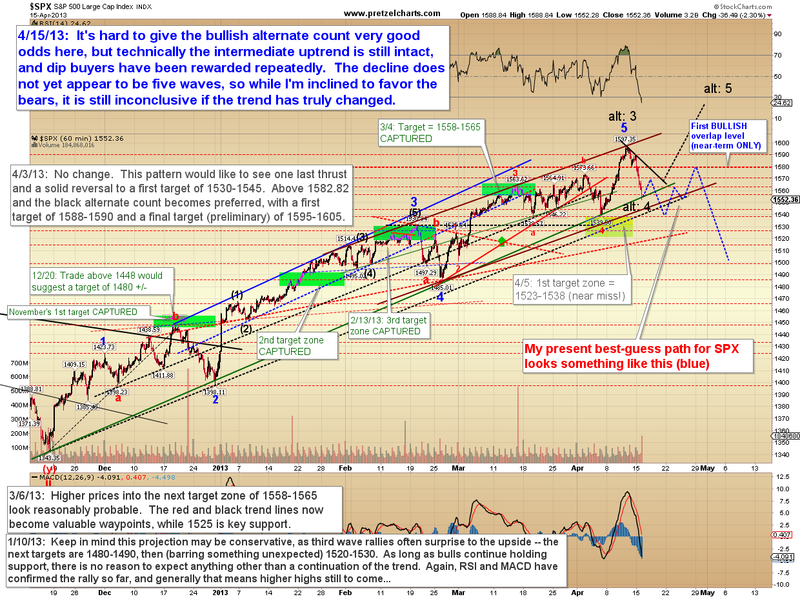 I have never been satisfied with the summer-2012 rally as a complete five-wave structure, and the decline into November also did not overlap the potential red wave (i) peak, which keeps the extended fifth wave viable. 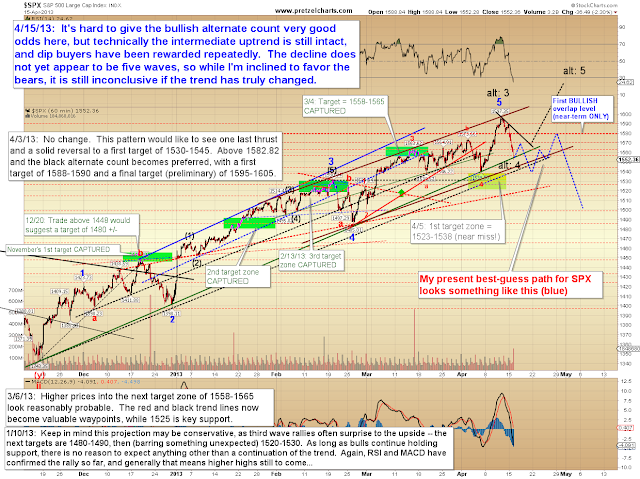 Though it's too early to say with certainty, the chart below does outline some signals and price levels. In conclusion, it's still a bit early to call an intermediate top, but there are numerous warning signals indicating that the "pot odds" seem to be shifting into the bears' favor. Accordingly, I think bulls will want to stay exceptionally cautious and nimble up here, and may want to consider standing aside entirely for the time being. In the next few updates, we'll also take a closer look at precious metals. Trade safe. Another excellent post, thanks so much.